One night, as I meandered through the darkness along our long driveway, with the intention of closing the front gate, I noticed a shadow. My driveway is covered in gravel, which in the moonlight sets off shadows normally but this shadow seemed ill shaped in comparison to what I was accustom to. I immediately ran back to the house to get both my husband and a flashlight. This was our first encounter with a snake, at the new house. It was early spring, and so he had come out to warm himself on the rocks, in the safety of darkness. Little did he know that I would have a gate to close and his presence hindered that action from happening. As a matter of fact, if I hadn’t been nearly as observant in my task, I would have stepped directly on him. or worse yet, rolled the gate over him. With a stick, we gingerly prodded him on. That summer, seeing snakes became a common occurrence. The men, who owned the house previously, had used it only for weekend trips or holidays. That meant that the wildlife was accustom to living their lives undisturbed. 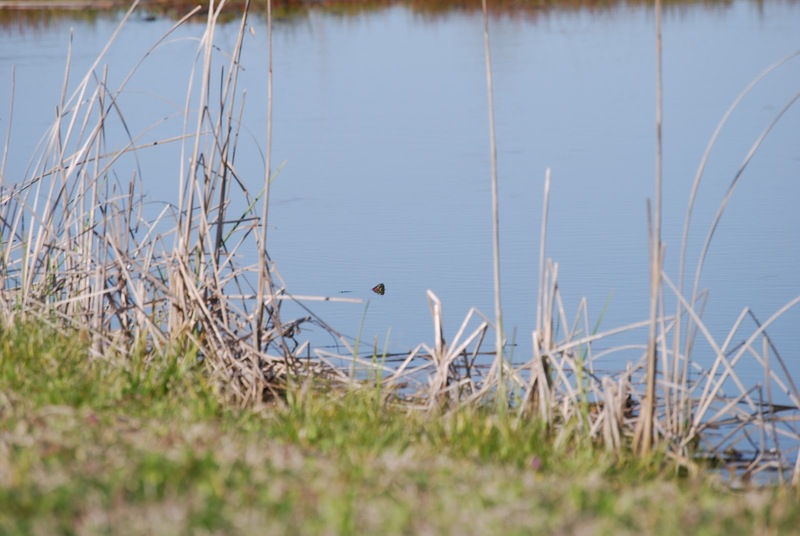 I sat, many a morning, in wait for the appearance of a snake’s head darting across our pond. Sometimes I got the better of them and sent them diving under the water. Sometimes they got the better of me by sliding away frantically and sending me, mid-step backwards with a scream. I quickly found a man on the internet who volunteered to identify my snake pictures. This helped both the snakes and I out considerably. 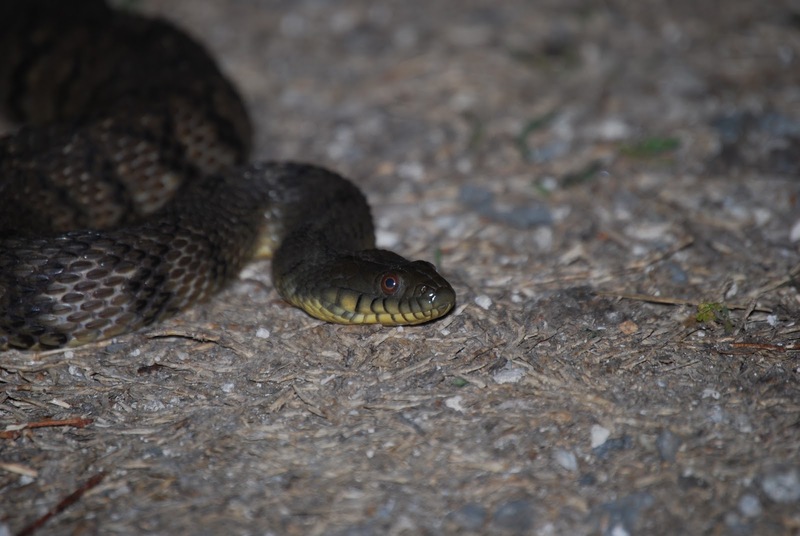 I grew quite brazen with the knowledge that never did I take a picture of an actual venomous snake. At first, I used to take pictures of all of our snake encounters. Most of which happened once we got chickens. Apparently, chicken snakes feel that a few effort free eggs are well worth the risk taken by being located sitting idle in a nest box. 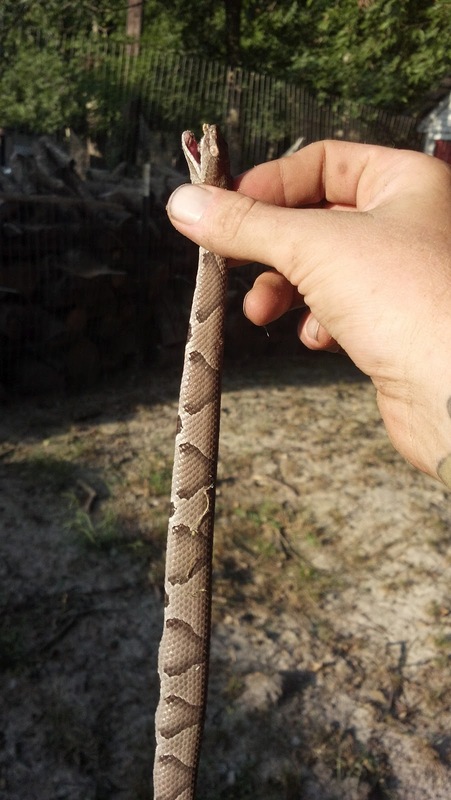 This is our first chicken snake… I felt confident, when he shook a “rattle free” tail, that it couldn’t be venomous if it needed to mimic a deadly snake. At first we picked up various yard instruments to remove said snakes and place them in a trash bags for relocation (and once a purse that had to be thrown away after it got pooped in). Now, Nick just reaches in, fearlessly and grabs the snakes. 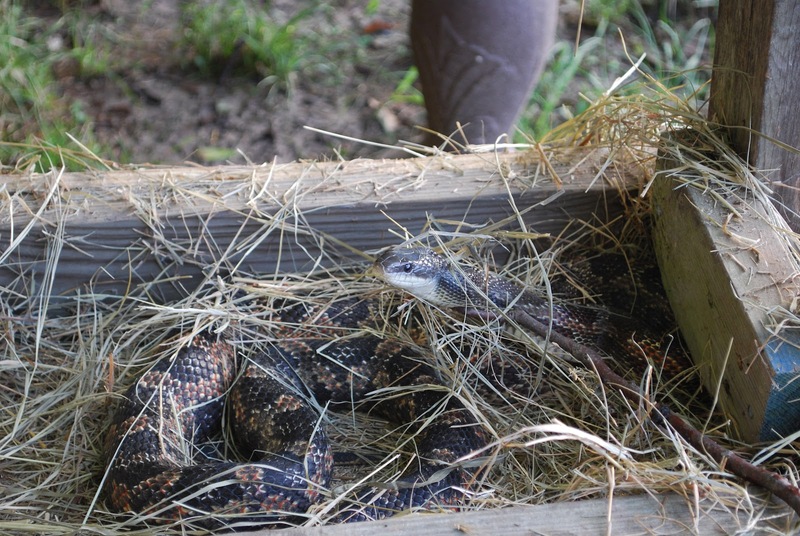 ONCE, when we had two snakes in the chicken coop, I stood as guard for the remaining snake while he went to find a trash bag to put the first in. When it ate the first egg, as I was watching, I felt giving a donation of an egg before sending him off in to the country abyss was fair. As it ate a second egg before swallowing the first, I tried to calmly justify that as well. However, as he had his mouth wrapped around the third egg, enough was enough and I grabbed him up and carried him out. Here is a picture of a snake with an egg in it’s stomach. What is interesting is you can delicately squeeze and break the egg. 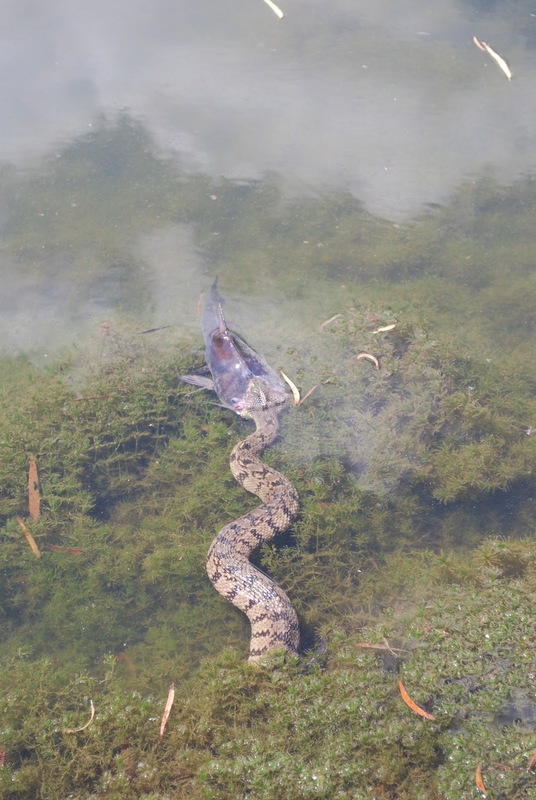 This is a picture of a non-venomous water snake on our pond. He never actually managed to swallow the fish. You have to admire his ambition though. We don’t just relocate snakes. 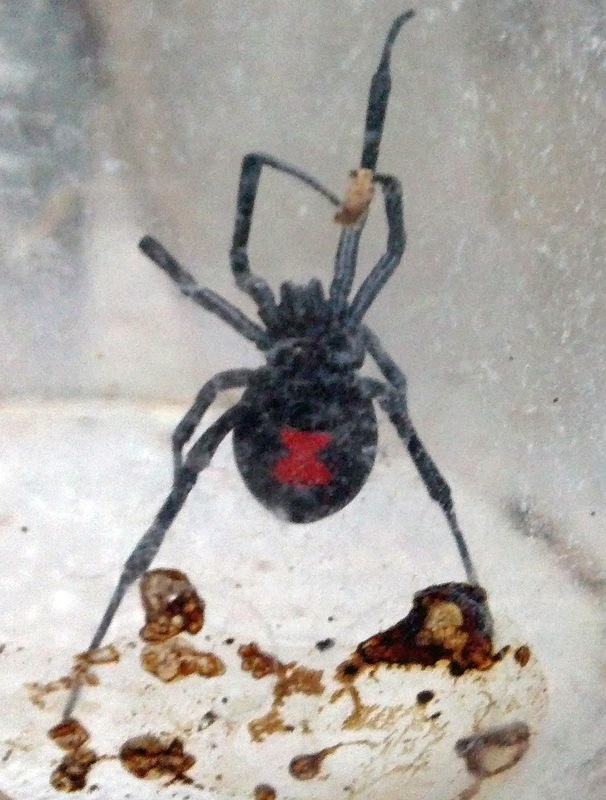 I forced Nick to catch a black widow last week, instead of killing it. Amusingly, he never questions why it is- that if I want to save the creatures he is the one being put at risk to do the actual saving. Living with snakes has become extremely mundane. They usually choose to run and hide rather than stand their ground. I appreciate this about them. And Nick, he has become an excellent snake catcher. He is fearless in his efforts now. No longer are yard instruments required, no longer does he run to grab a pair of thick gloves. Nope, now days, you say the word snake and he jumps up immediately and just goes in to grab the creature by it’s neck with the pizazz of Steve Irwin. As a matter of fact, last month, our son was moving some old stacks of wood from under our car port and found a sweet, pretty little snake curled up in a ball between the two by fours. Caden, who has been instructed to not mess with snakes, came in immediately to get his snake wrangler father. Who, jumped up and with ease grabbed up the juvenille reptile and shoved it in a bag to drive a couple of miles down the road. 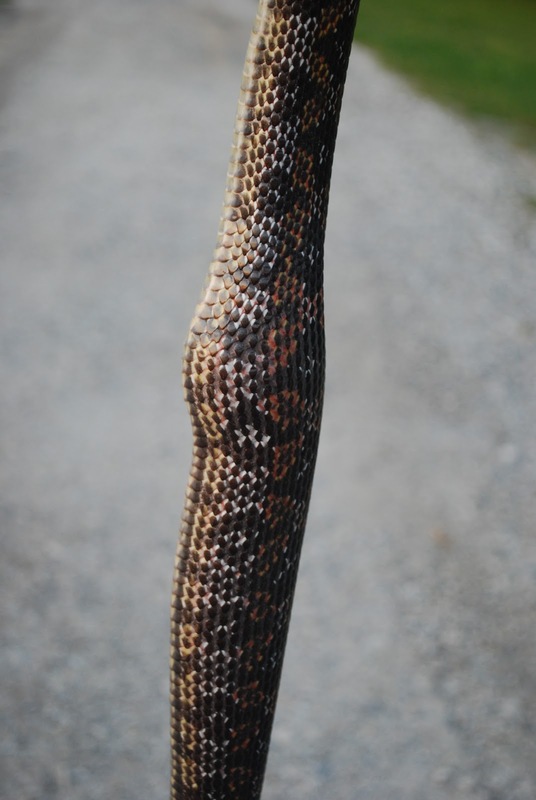 I, of course, photographed it for posterity; then emailed the picture to our snake identifier. It was a Southern Copperhead. Interestingly, the juvenille is far more deadly than the adult because they haven’t learned to regulate their venom yet. Pretty though, isn’t it?